Fast growing mobile data and fixed broadband subscriptions, supported by government initiatives to expand wireless and fixed broadband services, are expected to drive the Chinese telecom and pay-TV market revenues at a Compound Annual Growth Rate (CAGR) of 5.3% over the forecast period 2018–2023, according to leading data and analytics company GlobalData. The mobile data segment will go onto account for nearly 66% of total mobile service revenue by the end of 2023, primarily due to growing mobile internet subscriptions, particularly over smartphones, and rising adoption of 4G services with higher data ARPU. The company’s ‘China Country Intelligence Report’reveals that smartphone penetration will reach 93% by 2023, supported by increasing availability of a range of low-cost (under $100) 4G-compatible smartphones from domestic manufacturers such as Xiaomi, Huawei and Oppo. Fixed broadband revenue will also register significant growth over the forecast period, led by rising demand for high-speed fiber broadband services, and the ongoing FTTH/B deployments by operators like China Telecom. The government’s $174bn Information Infrastructure Construction project (2016-2018) to strengthen fiber-optic infrastructure in the country and the expansion of fiber-optic coverage to rural areas as part of the Ministry of Industry and Information Technology’s Internet Plus initiative, will also drive fixed broadband penetration and support revenue growth in the segment. While mobile voice revenue will decline over the forecast period due to falling mobile voice ARPU and growing substitution of mobile voice services with OTT- based communication solutions, fixed voice revenue will grow driven by increasing VoIP subscriptions. 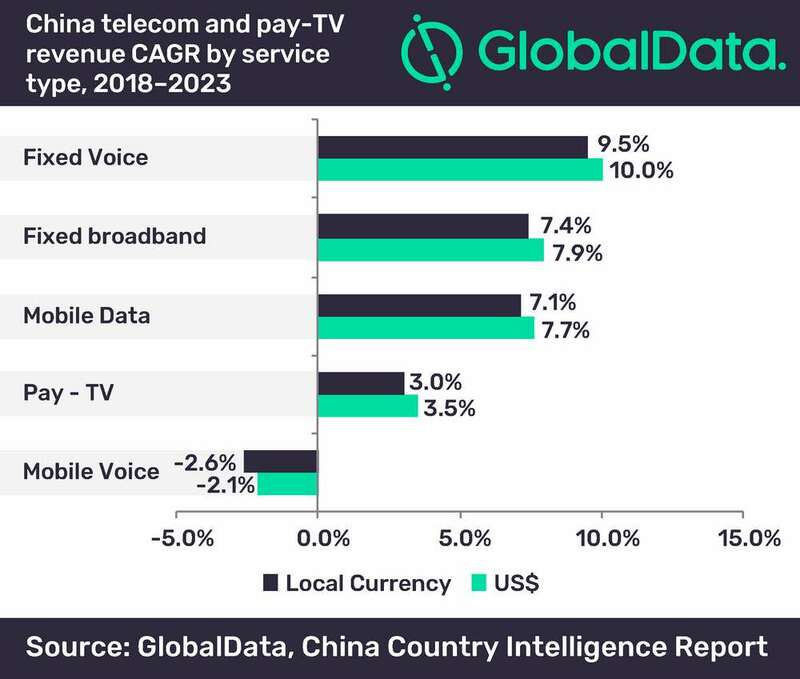 In the pay-TV market, GlobalData expects that the steady rise in IPTV subscriptions amid expansion of FTTH broadband networks will drive pay-TV revenues.